After saying our goodbyes to the Ruppman's and the Freedom, Buddy and I were off to Fort Myers, FL to visit good friend and Huckins enthusiast, Blake Matherly. We arrived to big smiles and hugs, spending only a short time catching up before Blake began regaling us with all the reasons he loves his boat, the Wanderer. As he invited us aboard, he took great pleasure in pointing out some of the finer points that endeared him to this Huckins model from the moment he laid eyes on it. The three of us—Blake, my husband, Buddy, and I—settled for a moment in the saloon as he explained why he and his wife favored his Huckins over other boats. "We like an express yacht instead of a flybridge yacht, so the style of this boat is just perfect for us," he said. "The large windows, the spacious saloon&elips;even the way it has all the speed we need when we want it, and none when we don't, makes it a great design. It really is perfect." It's the perfect boat for us; the style, the design, it's just perfect. They say that good things come to those who wait and that absence makes the heart grow fonder. In the case of Blake's love affair with his yacht, both of these expressions proved true. You see, when Blake and his wife, Delane, originally discovered the Wanderer, she belonged to another. So, they admired her from afar, never losing the hope to one day be at her helm. As luck would have it, their wait paid off when the original owner needed to sell and, naturally, Blake was ready for the opportunity to buy his dream boat at last. As I listened to Blake speak with such fondness and pride about the Wanderer during our visit, it was obvious that the reality had lived up to and, perhaps, even exceeded his expectations. We arrived to big smiles and hugs, spending only a short time catching up before Blake began regaling us with all the reasons he loves his boat, the Wanderer. 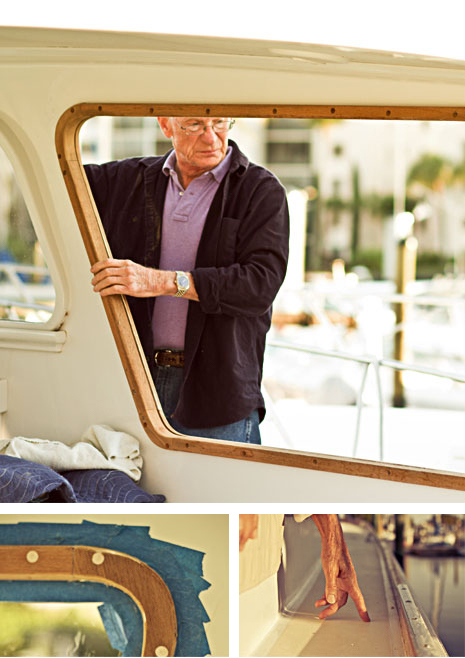 As he invited us aboard, he took great pleasure in pointing out some of the finer points that endeared him to this Huckins model from the moment he laid eyes on it. The three of us—Blake, my husband, Buddy, and I—settled for a moment in the saloon as he explained why he and his wife favored his Huckins over other boats. 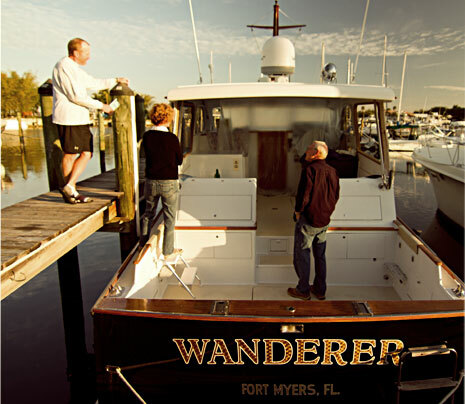 "We like an express yacht instead of a flybridge yacht, so the style of this boat is just perfect for us," he said. "The large windows, the spacious saloon&helips;even the way it has all the speed we need when we want it, and none when we don't, makes it a great design. It really is perfect." Taking the time to really get to know your Huckins, as the Matherly's have done, is so important. I always encourage new boat owners to spend plenty of time on their boat, to really get a sense of what they like and dislike, before making any big changes. When Buddy and I learn that a Huckins owner is planning any kind of modification to their yacht, we also share this next tip with them, just as we did with Blake. This one is actually less of a suggestion and more of a mandate—and it's one that my grandfather believed to be part of the Huckins tradition: keep weight off your boat. With any remodel, the number one concern we have at Huckins is how much weight you may be adding to your boat. We estimate that, on a 53-foot boat, every 2,000 pounds you add, you lose a knot. For Blake's boat, that number changes to 1,500 pounds per knot. It's a trade-off, but if you know this information ahead of time, you can make an educated decision about whether or not to add more weight to your boat. It's important to note that a Huckins 44' weighs roughly 24,000 lbs., while most boats this size weigh 7-10,000 lbs. heavier. The lighter weight is attributed to our signature core cell construction, which keeps our boats running at maximum efficiency. After talking to Blake about our concerns with adding weight to his boat, he let us know that he was having some trouble with water accumulating in his lazzarete. Offering guidance for this kind of quandary is precisely why I wanted to visit each and every one of our boats. I immediately offered that it could be caused by the gutter overflowing and Buddy shared that it may be an issue with the gasket. If you have draining problems, you can make the drains bigger to allow dirt to flow through the gutter, which will avoid it from stopping up the drains. Today, we design our boats with 2-inch PVC, (instead of a 90-degree elbow that sweeps) which allows the dirt to flush out completely. Obviously, dispensing advice isn't the only reason I have chosen to embark on this journey. Catching up with old friends and making a few new ones along the way is an added reward for my time spent and miles traveled. Since joining the Huckins gang, Blake has been a favorite at our boatyard. So when a phone call from my daughter, Field, interrupted our visit, it came as no surprise that she wanted say "hello" to Blake herself. Before I passed the phone to Blake, Buddy relayed that, when everyone from the yard heard we would be seeing him, they wanted us to send their regards as well. While Blake was on the phone with Field, Buddy had time to inspect the engine room—an area that Buddy considers to be his second home. 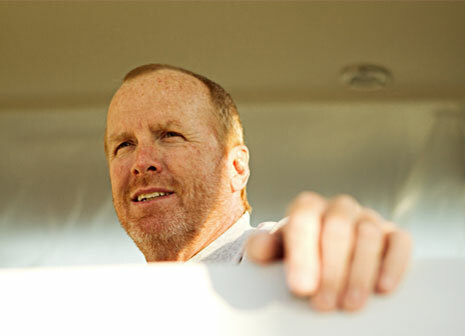 After Blake hung up the phone, Buddy shared great news: the engine room was in tip-top shape. Later, we all gathered back in the saloon, where Blake promised he had an amazing story to share before we got back on the road. Blake's story is up next.